It's officially fall here in Edinburgh- I mean, obviously, it has been for awhile, but we've had a bit of an Indian Summer here and it's been great. Judson and I have been taking the dog for long walks in crunchy leaves that she loves to pounce around in, and she's totally camouflaged when she goes frolicking in them. I've gotten out my tonka beans and my tiny nutmeg grater, have had my annual desire to spend an afternoon peeling and chopping apples and have finally given up on stone fruit and have started experimenting with pork chops, roasts, pies and anything I can think of with potatoes in it. I've gotten really into having friends over for brunch lately- this new habit has two root causes: 1) the brunch scene in Edinburgh is fine, but it doesn't compare to the brunch scene in any other city I've ever lived in, so there aren't a lot of options outside of my own kitchen (or at least, not options for breakfast foods I enjoy) and 2) I now have a doggo who gets me up every Saturday morning at... well, not the crack of dawn but awfully close. Which means I've got time in the morning to put the finishing touches on brunch things I prepped the night before, like quiches and fruit salads and baked eggs and loads of danishes and coffee cakes. One salad (berries with mint or greens with bitter vinaigrette). While banana bread or pumpkin squares or pound cake or gingerbread are all great options for a sweet dish because you can prepare them the night before, there's something about apple cakes that make your entire house smell like fall- a smell that somehow always persists until the next morning, and anyone who cooks always knows the faff that is peeling/coring/chopping a billion pounds of apples, so I feel like you enjoy it more because you know you worked for it. So here are two different recipes for apple cakes- one marginally simpler than the other, both delicious, one coffee-cake bar-style and the other bundt-pan, sliced and served with sauce style, but both totally worth serving the next time you have weekend guests or friends coming over on a Sunday morning or you just need a treat to reward yourself for making it through another harrowing week. 3 spoons out of five. This is very much my own preference, because this cake was great. Crunchy cinnamon mixture on top; pillowy-soft cake underneath? What's not to like? The answer: Nothing, I just liked the other one better. 4 spoons out of five. I knocked a spoon off because the first time I made this, it broke coming out of the pan. Since then, I've made it successfully about a billion times, but I feel like I should provide you with the warning. 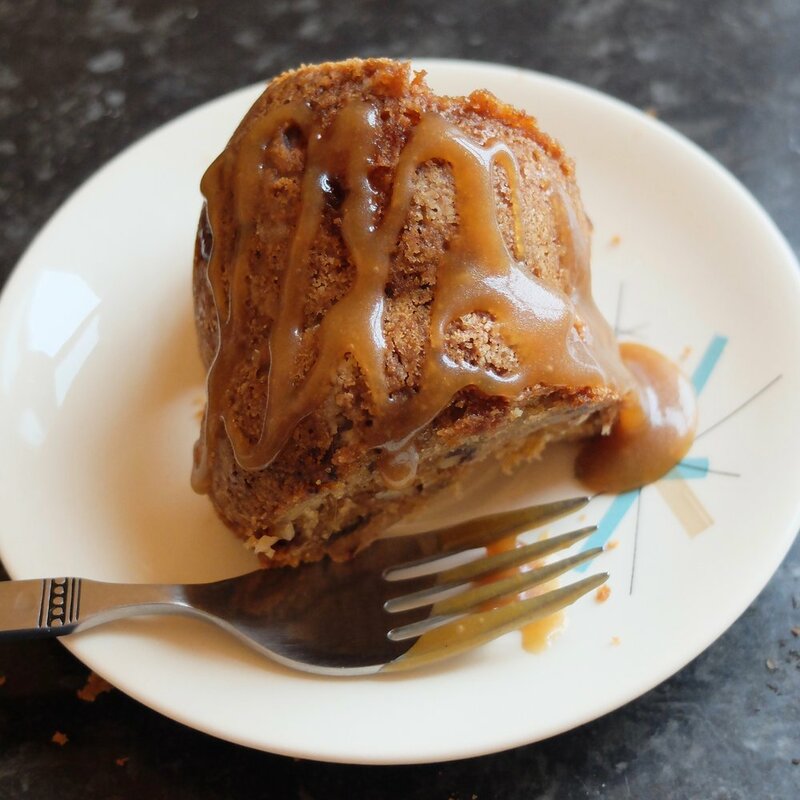 Caramel-y and sweet with a brown sugar toastiness you'll love, this cake is everything I love about breakfast in the autumn. Grease a 13x9 pan and preheat oven to 175C/350F. Add eggs and vanilla, then beat well. 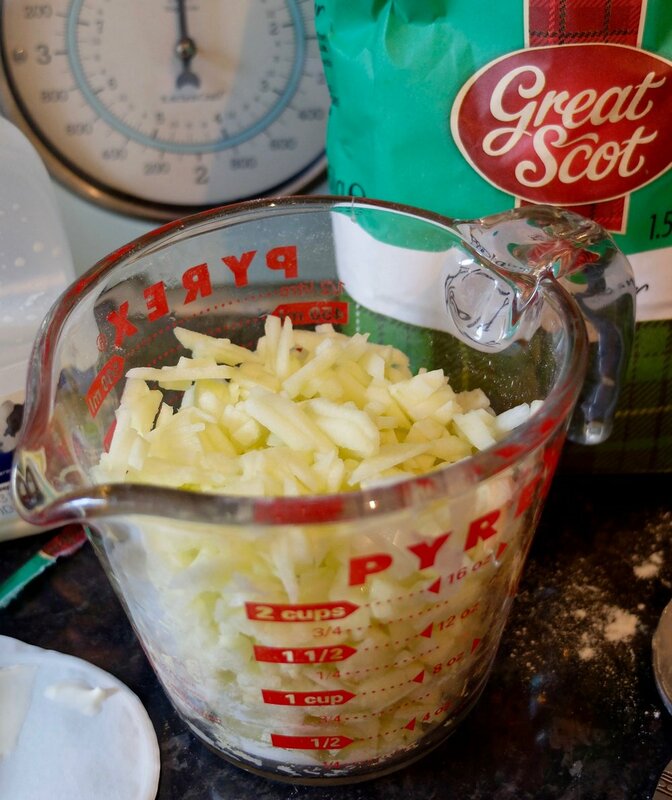 Stir together flour, baking powder, baking soda and salt, then add to creamed mixture alternately with sour cream. Fold in apples, then spread in prepared pan and set aside. In a small bowl, combine nuts, brown sugar and cinnamon. Stir in melted butter, then sprinkle nut mixture over pan. Bake 20-30 minutes until cake batter is cooked through. Grease and flour a 10-inch tube or bundt pan. Add oil and sugars, then beat for another three minutes. Sift together brown sugar, white sugar, cake flour, baking soda and cinnamon, then add slowly to creamed mixture, stirring constantly. Fold in apples, nuts and vanilla. Pour into prepared pan and bake for 55-60 minutes until a wooden pick inserted in the middle comes out slightly sticky (if in doubt, poke the cake a few times as batter will look thinner if you poke a piece of apple). While cake cools, make the glaze. Combine all ingredients in a small saucepan and slowly bring to a boil, stirring constantly. Turn off heat and allow to cool completely, stirring occasionally, before drizzling or pouring over cake.